When we went Dorset a few weeks ago, I enjoyed a wonderful afternoon drinking tea and eating cake with an old friend, one of my oldest friends actually. We were at school together and then shared a room together when we first left home to go to art school. Amazing to still be in touch twenty five years on, with six children and two husbands between us. Anyhow, she told me about an exhibition she'd recently been to at Bridport Arts Centre and recommended that I go see it if I could. The exhibition was called Blooming Marvellous and was described as "an intergenerational community knitting/crochet project culminating in a knitted/crocheted 3D garden". Intriguing don't you think? A knitted GARden?? How could I possibly not go and see for myself?! I really didn't know what to expect, it's quite a long time since I went to an art exhibition of any sorts. I was excited! And as I had Little Lady with me it felt like quite an adventure to be heading off to experience this together. It was a bit baffling at first. As everything was visible all at once, just entering the room was quite overwhelming. There was so much to see, big things and small things, a mind boggling amount to take in. We began to work our way slowly around the room. We had to crouch down as most of the exhibits were on the floor. But it was an absolute necessity to get reeeeeeeeally up-close as the detail in everything was un-be-liev-able. Ohh the work! The hours and hours and hours of creative work evident in this exhibition was astounding. This exuberant floral border blew me away. I loved the sheer fun of it, the absolute over-the-top, crazy joy of it! ....and we circled round and round this buzzy, yarny bee hive. ......and paused to appreciate this lush bowl of bright yarny fruit. Like I say, the teeny tiny details in this exhibition were wonderful. Everywhere you looked there was something to surprise and delight. Tiny little knitted ladybirds crawled along windowsills and up walls. A knitted spider sat in a big knitted web at the window. A knitted owl roosted above a doorway. We couldn't stop smiling at every new discovery. I think the veggie plot was my absolute favourite bit of all. I thought this little knitted tray of seedlings and seed packets was the cutest thing EVER. ....tumbling out of crates and bags. And can you see in the background there, a knitted shed! How ever many hours must it've taken to knit the side of a shed???!! Throughout the duration of the exhibition there were regular knitting workshops held at the arts centre, with free patterns and help available to encourage people to contribute a little knitted something. 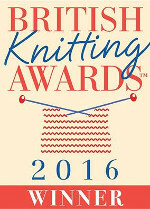 The idea was to inspire people to become involved, to encourage the social aspects of knitting and crocheting together. Since coming home and reading the blog about the exhibition, it's become apparent just how many people were involved with it's creation. It was a huge community undertaking. This exhibition is sooooo much more than a collection of quirky handmade objects. The community spirit, the skill and the humour is truly awe inspiring. "HI, Just been sent the link to your Blog -it is wonderful and thank you all for writing such lovely things about it. I am the artist who organised this project with 1600 fantistic knitters - the youngest was 2 and the oldest was 99! Many of the knitters had disabilties including visual impairment, physical disability, learning disability and 42 groups took part. The garden is on tour around the UK. It is at Poole at Lighthouse art centre until 15th October and then will go into hibernation for the winter and will be at Durlston Country Park, Swanage in Dorset next Easter, then a casle in Wales for a few months then a museum in Yorkshire. It is avaialbe to hire and i would love some bokkings for it for over this winter rather than have it in storage. this is fantastic, thank you for sharing, do you have a pattern for the beehive and bumble bees. Don't want the hive that big and only want a few bees, but would love to make one for my great niece. Wow I have never seen anything like this my entire life. Very creative, I wish I could see this in person. I remember knitting a poppy for a knitted garden, which was just starting off, at a Brighton Knit & Stitch exhibition a few years back. Maybe it turned into this garden? I saw a crocheted geranium at a friend's house and have been wanting to make my own ever since, but THIS is immense! All this from a piece of humble yarn and very large dose of inspiration, time and talent. I have been admiring the pictures of this Marvelous Knitted Garden since last year! I stumbled on the pictures I believe on Flickr. Oh WOW what an honor it must have been to see this absolutely stunning garden in person! I'm speechless! You create in knitting what I do in paper--what a lovely garden you've cultivated! HI, Just been sent the link to your Blog -it is wonderful and thank you all for writing such lovely things about it. I am the artist who organised this project with 1600 fantistic knitters - the youngest was 2 and the oldest was 99! Many of the knitters had disabilties including visual impairment, physical disability, learning disability and 42 groups took part. WOW, this is off the hook amazing and to think about the tons of work that went into it, whew, nice work at that! Its Awesome how did u do it? It must have toke forever!!! Wow! That is amazing! Thank you for sharing it, I wish that I had been able to see it first-hand, but appreciate your view. I love the frogs floating on the pond. Fabulous. I too want the beehive. Thank you so much for sharing. AMAZING!!! i was just like :O all the detail thats been put into it!! I LOVE IT!! Totally wonderful! Thank you so much for posting these photos. So much love and beauty- it made me cry! You may enjoy the knitted shed left over from a previous 'I Love West Leeds' festival and now resident in Armley Mills Industrial Museum.